If you are familiar with a recent post where I asked people to help me decide which new phone to get you may be interested to know that I finally decided on the Samsung Galaxy 4S. 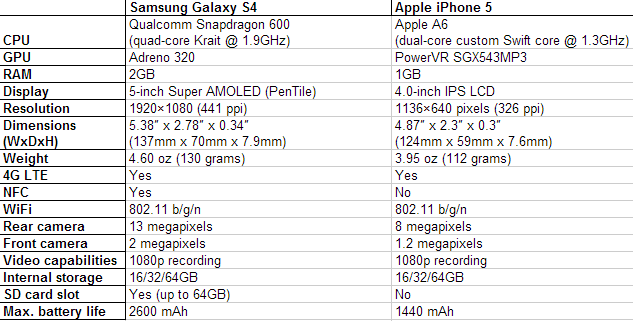 There are a number of reasons that swayed my decision as it was a difficult choice between the iPhone 5 and the Galaxy 4S. In the end the combination of better battery life on the Galaxy 4S, the Swype typing feature (I LOVE this) were two primary reasons to stay with an Android device, Apple’s arrogance was a third reason. Keep in mind that at work I use a Mac every day and like the platform very much although Mac Mail is just ok. So I had every reason to try to stay within the Apple world for what would seemingly be the most seamless integration between various devices like phones, tablets and computers. In fact it seemed a foregone conclusion that were I to get an iPhone (we have an iPad already), my next laptop or notebook would have to be a MacBook Air or something along those lines (another really good machine). So why do I feel Apple is arrogant (yes I realize I am not alone here)? That Apple does not really want to play in the sandbox with the other platforms is a major frustration. The Apple iCal function does not integrate well with Google but it does do better with MS Outlook. I use Google Calendar and I like it but apparently iCal does not. Another example is that just this week I logged into my Android app for Hopstop which offers mass transit advice and best directions for subways and buses etc. in New York City as well as a host of others. I had not logged on in quite a while – in fact long enough that I had forgotten that Apple had purchased Hop Stop last fall. What I had not realized is that Apple in its infinite wisdom had decided to pull Android support for Hop Stop making the app no longer functional. Exactly how does taking the Hop Stop app out of the Android platform make things better for people? Or Apple for that matter? Why does Apple feel the need to take things away? Remember the fiasco with Google Maps? How did that work out in the end? *Spoiler Alert if you’ve been sleeping for more than a year – Apple reversed itself and put Google Maps functionality back into the Apple Store. As I will say repeatedly, in general Apple is a great platform and has been an amazing innovator although not so much lately apologies to Mr. Cook. That Apple has a legion of fanatics that can only see – a Red Apple is well documented. And at times those same ‘Apple is everything’ attitudes come off as being – well, arrogant. Google pitched the slogan ‘Don’t be evil’. Apple’s might be – ‘Up your nose with a rubber hose Android’. The Android OS users know what I am talking about. Would any of the Apple acolytes admit its platform arrogance? This entry was posted in Mobile Communication, Technology, Uncategorized and tagged Apple being arrogant, Apple iPhone 5 versus Samsung Galaxy S4, best Android devices, Choosing a Samsung Galaxy 4s or an iPhone 5, Choosing an iPhone or Android phone, Google Maps Apple, Swype typing. Bookmark the permalink. Good post. Apple stuff works great if your whole world is Apple. Not as well if you have to interact with things outside that ecosystem. Android is not perfect, but it interacts with non-android things very well. And there you have it. Thanks Nader.